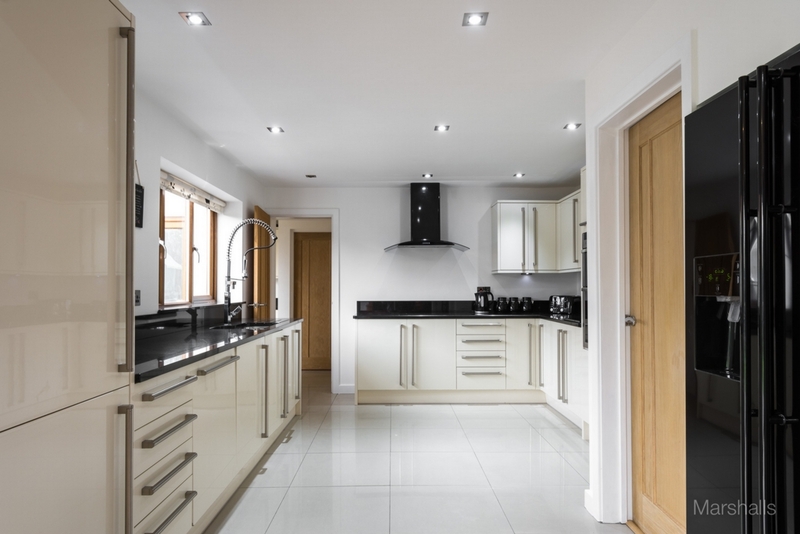 Marshalls Estate Agents are delighted to offer this extended and refurbished modern family home. The property offers six bedrooms with three en-suites and three separate reception rooms. 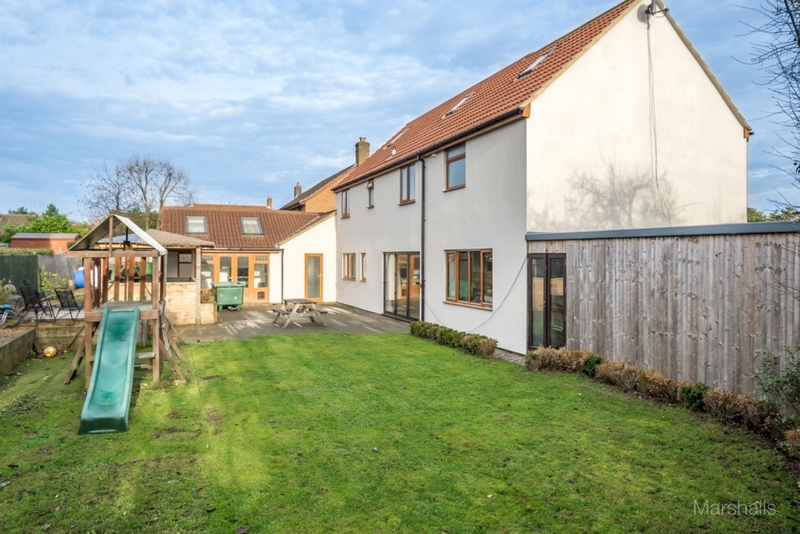 Located in a cul-de-sac, the property also offers off road parking for several vehicles and a 31' tandem garage. 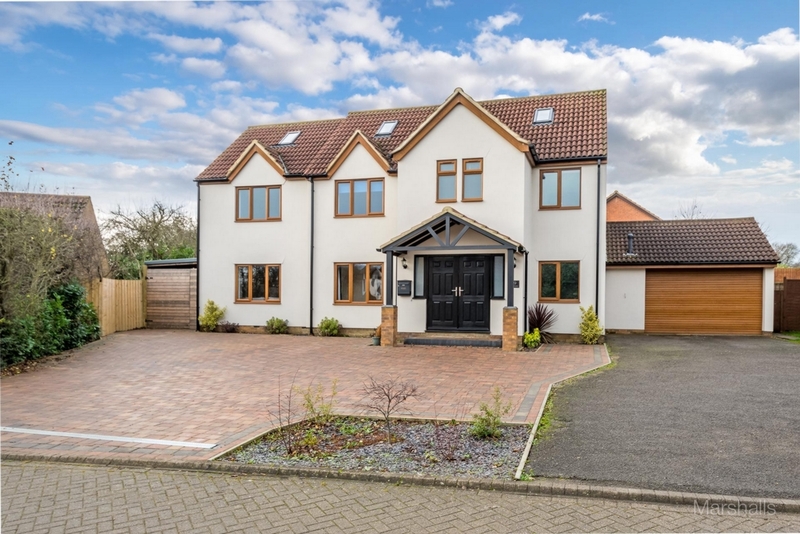 Only a few minutes away from Furzton Lake, this property is a must view! ENTRY: Via composite double doors with glazed panels to both sides. ENTRANCE PORCH 2.83m (9'3) x 1.79m (5'10): Inset ceiling spot lights, radiator, door to coat cupboard, laminate flooring, glazed double doors to entrance hall. 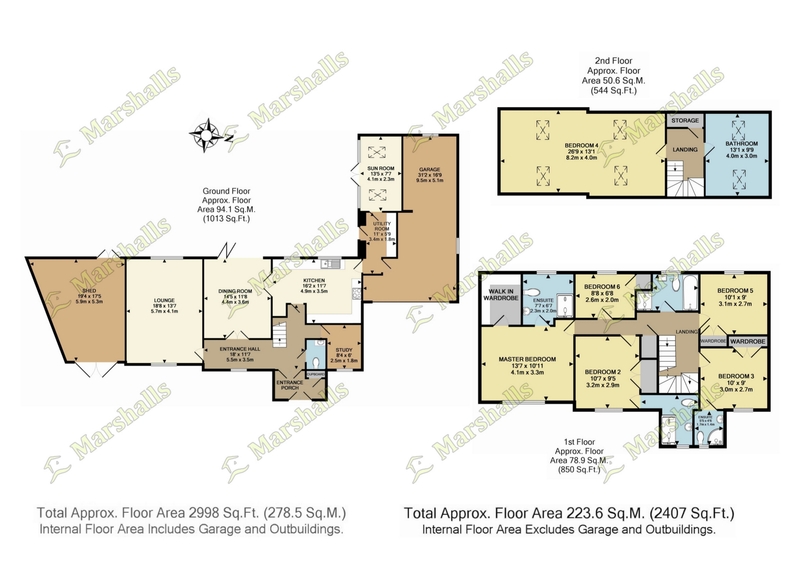 ENTRANCE HALL 5.47m (17'11) x 1.70m (5'6): Inset ceiling spot lights, radiator, stairs rising to first floor, laminate flooring, doors to: cloakroom, study, kitchen, dining room and lounge. 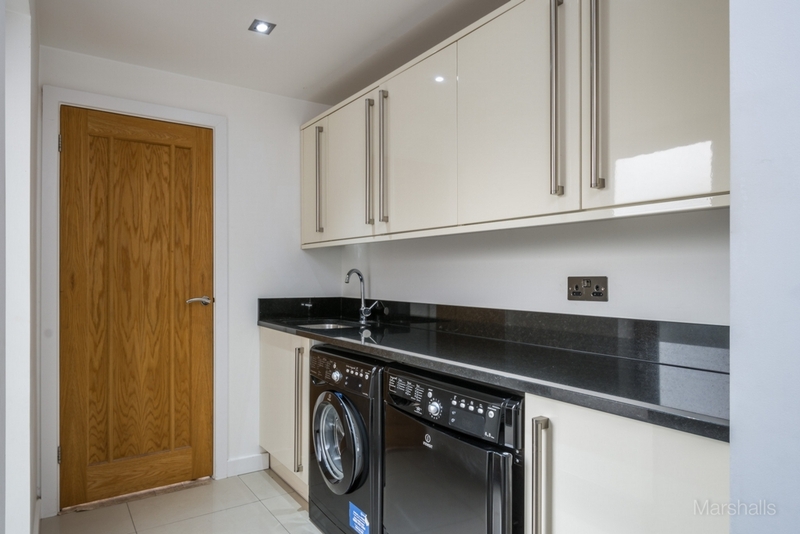 CLOAKROOM: Inset ceiling spot lights, coving to ceiling, heated towel radiator, extractor, fitted with a two piece suite comprising of a low level WC and wall mounted hand wash basin with mixer tap and vanity unit under, under floor heating. 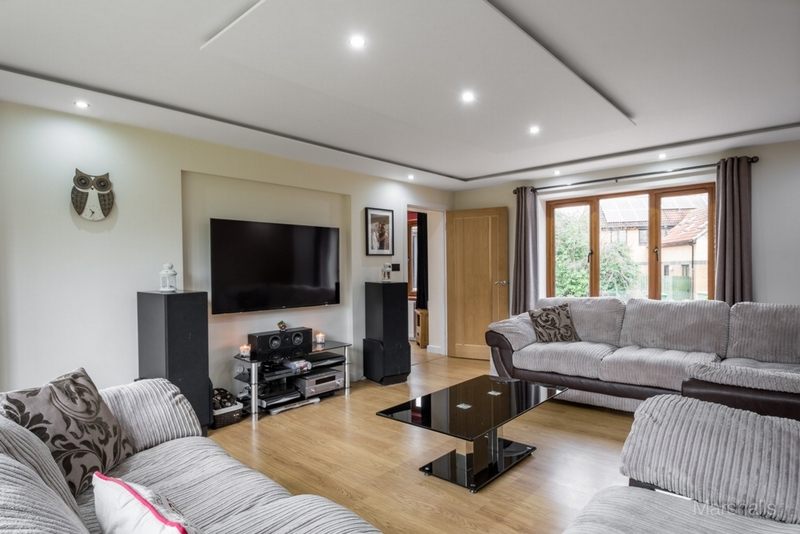 LOUNGE 5.73m (18'9) x 4.23m (13'10): Inset ceiling spot lights, inset audio speakers to ceiling, two UPVC double glazed windows to front and rear aspect, television point, laminate flooring. 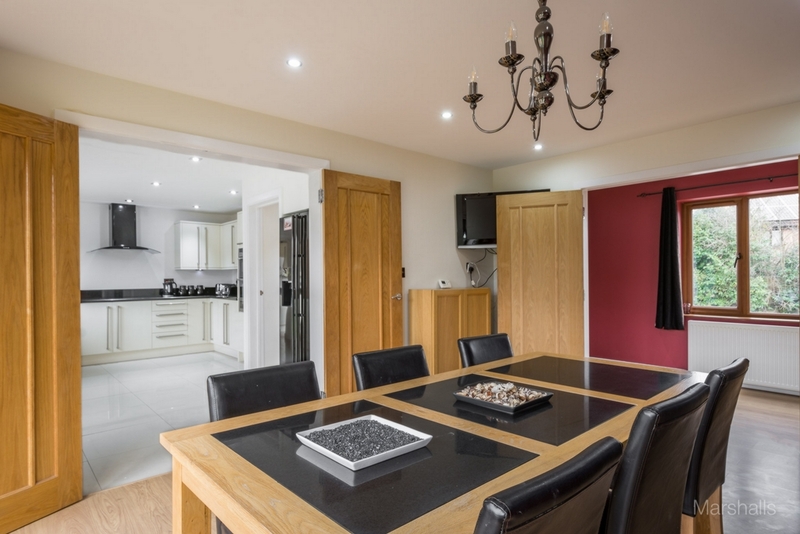 DINING ROOM 4.61m (15'1) x 3.53m (11'7): Inset ceiling spot lights, bi-fold double glazed doors to garden, radiator, double doors to kitchen, laminate flooring. 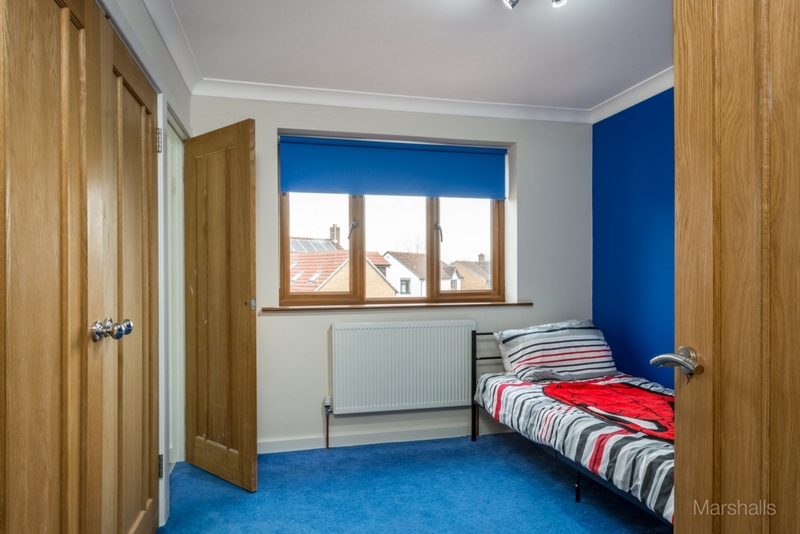 STUDY 2.53m (8'3) x 2.21m (7'3): Inset ceiling spot lights, coving to ceiling, UPVC double glazed window to front aspect, radiator, telephone point. KITCHEN 4.92m (16'2) x 3.53m (11'7): Inset ceiling spot lights, two UPVC double glazed window to rear aspect, fitted with a range of wall and base mounted units with squared edge granite work surfaces over, one and a half bowl stainless steel sink unit with designer mixer tap with pull out auxiliary tap, space and plumbing for American style fridge freezer, built-in double oven and grill, built-in microwave, induction hob with chimney style extractor over, ceramic tiled floor, under floor heating, door to utility room. UTILITY ROOM 3.36m (11') x 1.76m (5'9): Inset ceiling spot lights, fitted with wall and base mounted units with squared edge granite work surfaces over, inset stainless steel sink with mixer tap, space and plumbing for washing machine and tumble dryer, ceramic tiled floor, under floor heating, doors to: sun room, rear garden and garage. 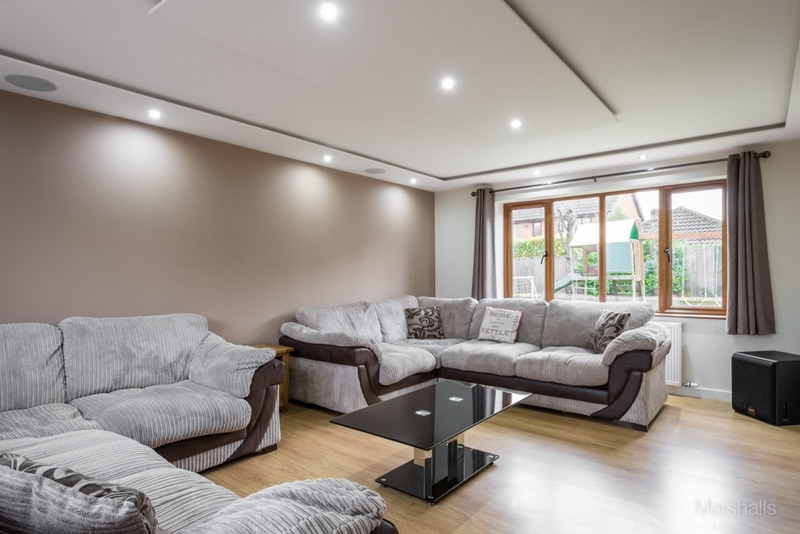 SUN ROOM 4.11m (13'5) x 2.56m (8'4): Inset ceiling spot lights to vaulted ceiling, two Velux windows, UPVC double glazed doors to rear, UPVC double glazed window to rear aspect, television point, under floor heating. FIRST FLOOR LANDING: Inset ceiling spot lights, stairs rising to second floor landing, doors to: bedrooms one, two, three, five and seven and family bathroom. 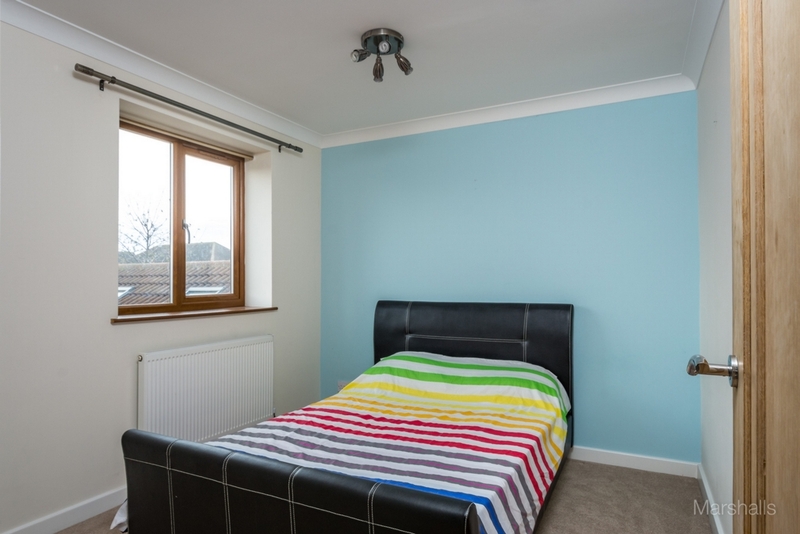 BEDROOM ONE 4.15m (13'7) x 3.64m (11'11): Ceiling light, UPVC double glazed window to front aspect, radiator, doors to en-suite and walk-in wardrobe. 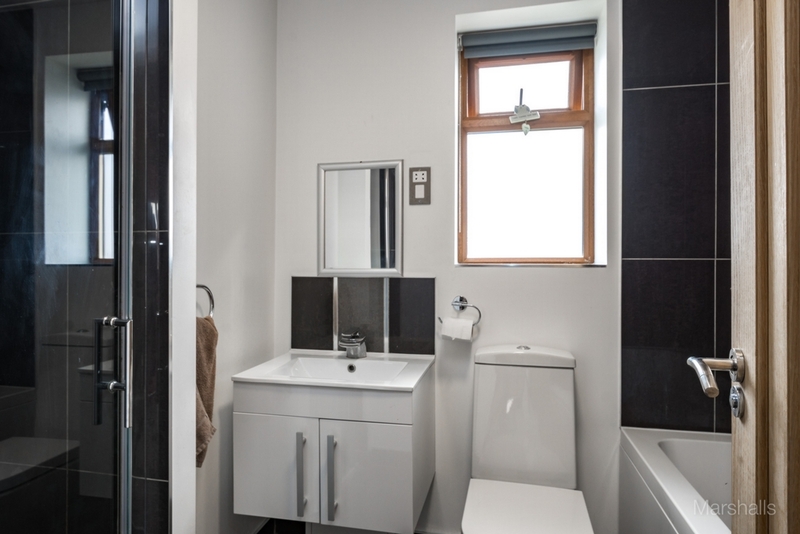 EN-SUITE: Inset ceiling spot lights, UPVC double glazed window to rear aspect, heated towel radiator, fitted with his and hers hand wash basins with mixer taps, double shower cubicle with thermostatic shower tap, low level WC, part tiled walls, ceramic tiled floor, under floor heating. 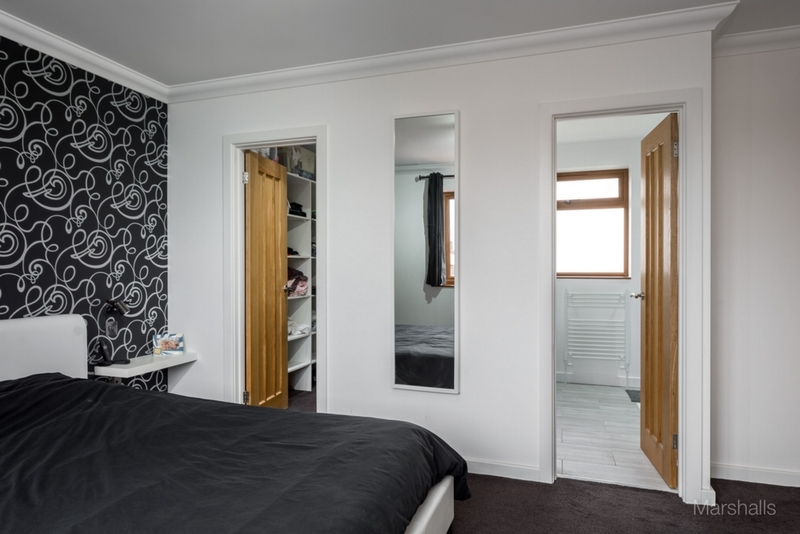 WALK-IN WARDROBE 2.38m (7'8) x 1.74m (5'7): Inset ceiling spot lights, fitted with: hanging rails, drawer units and dressing table, radiator. 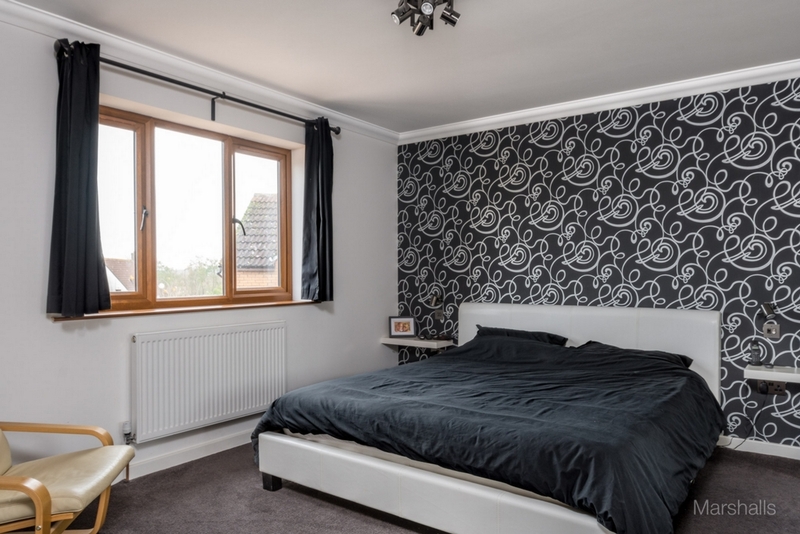 BEDROOM TWO 3.23m (10'7) x 2.88m (9'4): Ceiling light, UPVC double glazed window to front aspect, radiator, built-in wardrobe, door to en-suite. EN-SUITE: Inset ceiling spot lights, UPVC double glazed window to front aspect, heated towel radiator, fitted with a three piece suite comprising: double shower cubicle with thermostatic shower unit, wall mounted hand wash basin with mixer tap and vanity unit under and a low level WC, part tiled walls, ceramic tiled floor. BEDROOM THREE 3.03m (9'11) x 2.95m (9'): Ceiling light, coving to ceiling, UPVC double glazed window to front aspect, radiator, built-in wardrobe, door to en-suite. EN-SUITE: Inset ceiling spot lights, UPVC double glazed window to front aspect, fitted with a three piece suite comprising: low level WC, hand wash basin with mixer tap and vanity unit under, shower cubicle with thermostatic tap, heated towel radiator, part tiled walls, ceramic tiled floor. BEDROOM FIVE 3.07m (10'11) x 2.72m (8'11): Ceiling light, coving to ceiling, UPVC double glazed window to rear aspect, radiator, built-in wardrobe. 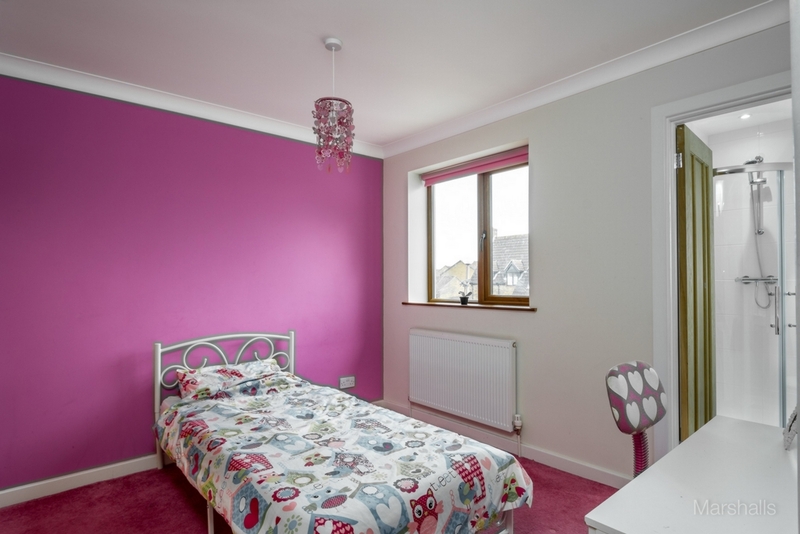 BEDROOM SIX 2.69m (8'10) x 2.62m (8'7): Ceiling light, UPVC double glazed window to rear aspect, radiator, built-in wardrobe. FAMILY BATHROOM: Ceiling light, UPVC double glazed window to rear aspect, fitted with a four piece suite comprising: low level WC, wall mounted hand wash basin with mixer tap and vanity unit under, panelled bath with mixer tap and hand held shower attachment and a separate shower cubicle with thermostatic tap and rain style shower head, part tiled walls, ceramic tiled floor. 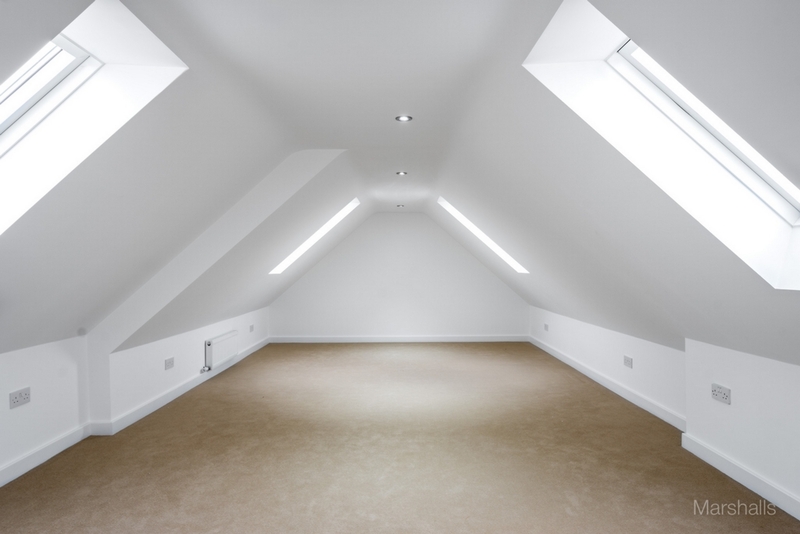 SECOND FLOOR LANDING: Ceiling light, Velux window, doors to bedrooms four and six. BEDROOM FOUR 8.15m (26'8) x 4m (13'1) max with head height restrictions: Inset ceiling spot lights, four Velux windows, two radiators. 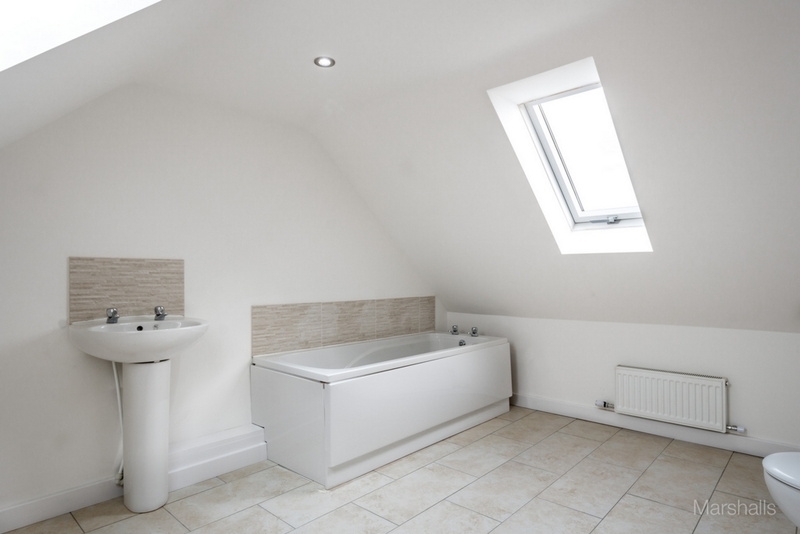 BATHROOM 4m (13'1) x 2.96m (9'8) max with head height restrictions: Inset ceiling spot lights, two Velux windows, radiator, fitted with a three piece suite comprising of a panelled bath, low level WC and pedestal hand wash basin, part tiled walls, ceramic tiled floor. GARAGE 9.5m (31'2) x 5.12m (16'9) max: Electric roller door, power and light, double glazed window to side and rear aspects, insulated and plastered walls. PARKING: Block paved parking plus driveway leading to garage providing parking for several vehicles. SHED 5.88m (19'3) max x 5.05m (16'6) max: Concrete floor base, enclosed by timber frame and panels, doors to front and rear. 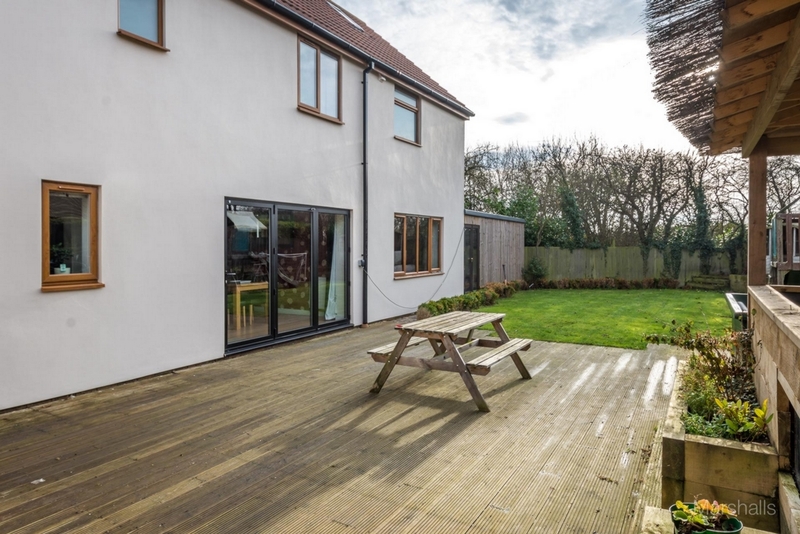 REAR GARDEN: Part decked with remainder laid to lawn, raised flower beds, summer house to remain, purpose built covered fish pond, raised patio, various plants and shrubs, outside tap and power, all enclosed by wood panelled fencing.